Easily create email accounts, available through the standard protocols including POP, IMAP, and SMTP, all with or without SSL encryption. Our cPanel software also supports Push Email via IMAP IDLE, enabling fast incoming and outgoing mail delivery designed with mobile users in mind. 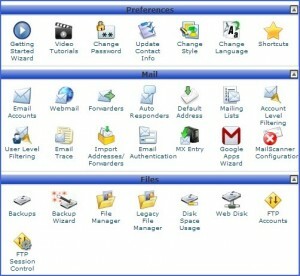 cPanel software provides several web-based interfaces for checking email, including Horde, Roundcube, and SquirrelMail. You have the ability to access your email from any web browser, as well as configure many account options including email forwarding and auto-responders. To help curb spam, our cPanel software gives you the option of using powerful spam filters, SpamAssassin, and BoxTrapper. These powerful utilities analyze your incoming mail, looking at the source and content of the message, as well as comparing it against lists of known spammers. You can also setup spam filter rules which route messages to a spam folder, helping to keep your inbox uncluttered at all times. Set up email forwarding which allows account holders to have an address at one domain (such as your-name@yourdomainname.com) and forward incoming messages to another (such as user@gmail.com). For power users, mail filtering is available for improved organization and handling of incoming mail, as well as a mailing list function to enable your users to engage in discussions via email. 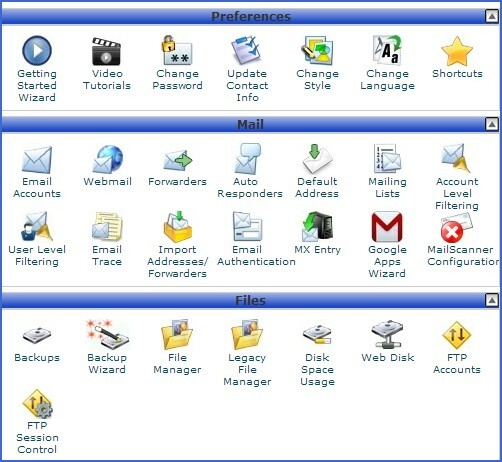 Backing up data is simple with cPanel software’s “Backup Wizard.” With a few clicks, cPanel software will make a full backup of your databases, email, and web sites, which you can download to your computer or send to another server over SCP or FTP. Khimaira-GreenEarthHost also backs up all websites daily. cPanel software makes it easy to manage databases. All of your database tasks, ranging from creating databases to manually editing tables, can be done through cPanel. 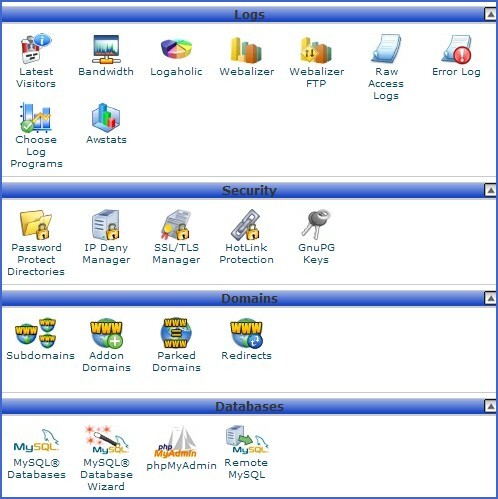 As a standard, cPanel supports MySQL databases, with the ability to add PostgreSQL as well. To minimize setup time, cPanel software includes a “Getting Started Wizard,” which will walk you through the initial configuration of your account. Step-by-step tutorials, on-screen documentation, and other useful information is available through the Wizard. Subdomains are your domain (example.com), with a prefix (sub.example.com). Parked Domains are additional addresses that point to the same website. Add-on domains are addresses that can point to a specific section of your hosting, allowing you to run several websites from your account, sharing the total package space. Just place an order with Khimaira-GreenEarthHost, and we will register your new names and make them ready to be used as parked or Add-on domains. 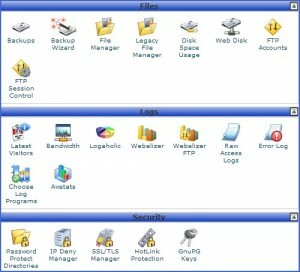 With our cPanel software, you have several options for managing your website content. Utilize traditional file transfer methods (including FTP, SFTP, and FTPS). In addition to offering various file management tools, cPanel software makes it easy to manage FTP accounts for employees or colleagues, enabling other users to upload files with optional security restrictions. With a few clicks, you can install commonly used web-based applications, such as WordPress, Joomla!, and much more simply by answering a few quick questions through Softaculous installer, in your cPanel. cPanel’s intuitive and highly customizable interface will provide you with an environment that will grow and evolve as your needs change. See list of available One Click applications on our Hosting Plan information page. 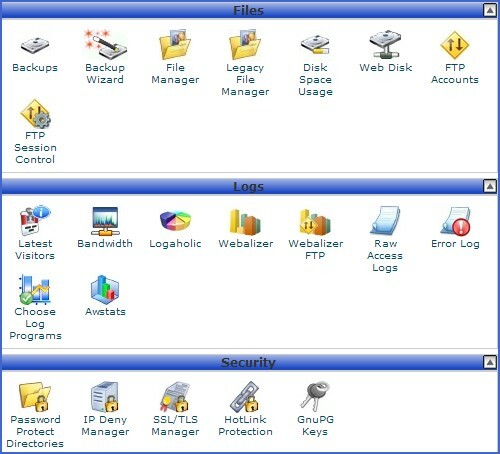 cPanel software offers a range of built-in log file statistics. Through log processing programs such as Webalizer and Analog Stats, you can see how many times your websites have been visited, what search words are used by your visitors as well as which pages are being accessed or how much email you’ve been sending.